I should start by saying a few words about the guest bike: AWESOME! It kinda makes my V-Twins seem heavy and slow, so I don't want to talk much about performance. I'll just say it feels like it wants to go seriously fast to have serious fun. And what it might lack in personality, it certainly makes up for in function. It's a Honda, so it does everything right. You name it -- clutch, gearbox, throttle response, brake feel, suspension -- everything just works proper. I had almost forgot what it was like to ride with functioning mirrors. Of course, what makes this bike special is the Limited Edition Repsol Replica livery, inspired by the HRC Honda that Owensboro native Nicky Hayden used to win the 2006 MotoGP Championship. Road racing fans are a passionate bunch, and while some were quick to discount Nick's World Championship because he won only two races that year and GOAT-candidate Valentino Rossi suffered some mechanical issues, the truth is that he went into the final race of the season with a broken shoulder and down on points to Rossi. It was a one-race two-man battle for the title, and The Kentucky Kid emerged victorious in Valencia! All three Hayden Brothers have won national road racing Championships, and whenever I run into any of 'em I always thank them for representing Kentucky so well. On that day in Spain, the middle brother took it to the highest level. He did the impossible -- he stole the biggest prize from the greatest racer alive. He had reached the pinnacle of road racing, and he was bringing that trophy home. That's how you represent! The well-deserved Championship was built on a foundation of consistent podium finishes and a country-bred work ethic, then topped off with a sheer will that helped overcome some odd late-season adversity. It was a perfect example for my boys of what can be achieved with a positive attitude, hard work, & solid family support. It was epic. I laughed. I cried. I still believe it was the greatest moment in Kentucky history since about 1792. I had these paintings made for the home office at about the same time Honda was building our Repsol Replica. The middle frame contains a print from SuperbikePlanet.com. Owensboro, KY is not only famous for producing world-class racers like the Hayden Brothers or the Waltrips, but also for producing world-class BBQ. Calling itself 'The BBQ Capital of the World' [a moniker used by several other cities in the South], it hosts the International Bar-B-Q Festival in May of every year. The best thing about BBQ is that it varies so much from one region to the next, and Daviess County BBQ is known specifically for two things: Mutton & Burgoo. Mutton is the meat from an older sheep and Burgoo is basically a BBQ stew. I started our ride on the Honda and Mark rode my KTM. It's always weird to watch someone else ride your bike. So the dude who let me borrow his Honda must think it's doubly weird watching two people ride his! Mark also had his GoPro on head for a second perspective on the day. The thing about my 'No GPS' rule is that we often miss a few turns along the way. We only had to turn around three times on the way there. We switched rides early on. Why? Because Mark has a Repsol jacket and I don't. ...and this one from Mark's. Heading into the OWB on a beautiful day. Here's Old Hickory. With their famous buffet, Moonlite is the most well-known BBQ joint in town. But most Owensboro natives recommend Old Hickory to me. This establishment has been in business under one name or another for over 90 years while being passed down through several generations of the Foreman family, so they must know what they're doing. Ain't nothin' wrong with this view when you walk in the front door! They obviously do a healthy carry-out business. Each plate comes with sliced bread, onions, and pickles. Clockwise: Pork Ribs, Chopped Pork, & Mutton. VERDICT: I cannot offer a fair verdict in this case, and that's because I made a huge mistake. I should have perused the menu more carefully, or asked the waitress more questions. I should have ordered my meats "off the pit," as they say -- that would be dry with the sauce on the side. To be clear, I did not dislike their sauce. But it did overpower any hickory smoked flavor in the Mutton and Chopped Pork, and I'm sure my experience would have been better had I ordered properly. The Pork Ribs were my favorite item on the plate because with a lower sauce-to-meat ratio it was possible to get a true taste of the BBQ. And they really couldn't have been cooked better. Along those same lines, the Mutton was more tender than I expected for such a tough meat. The texture and the taste reminded both Mark and I of a slow cooked beef roast (with BBQ sauce). So it wasn't a big surprise that the Burgoo, which contains plenty of Mutton, tasted much like a nice vegetable beef stew (with BBQ sauce). There was nothing remarkable about any of the side items, though the portion sizes were just right and I don't think people come here for potato salad or beans or fries, anyway. The meat menu is extensive: Mutton, Mutton Ribs, Pork, Pork Ribs, Chicken, Turkey, Ham, and Catfish. You can choose any three of those meats & two sides if you order the Combination Plate, and you'll definitely get your money's worth. I look forward to a return visit where I get my order right and I can sample some Mutton Ribs. I shall report back. These bikes couldn't be much more different, but they do have Orange in common. I'm not sure about Black, because I think the CBR's Black might really be Blue. It's weird. And they garnered some attention throughout the day. Apparently this is the city of Hartford, KY. The end of The Esses. Rounding the top of Turkey Hill. 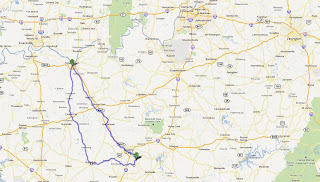 UPDATE (12/4/12): A different route in a different Honda going back to Owensboro on a day with very different weather for a different reason. I wasn't there for BBQ, but I couldn't help but stop by Old Hickory and grab some to take home. I've become more familiar with Owensboro's black dip since my first visit, and I do like it, but I don't like my meats drenched in it. I much prefer Old Hickory's BBQ "off the pit" with some sauce on the side. Old Hickory's Mutton Ribs & Sliced Pork off the pit (to go). 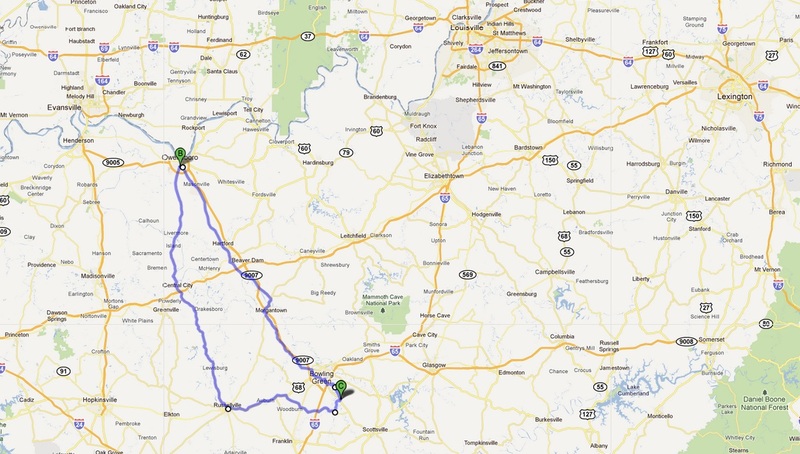 Another great blog post, I did a Southern BBq Tour on my CBR a few years back and Old Hickory Pit BBq was one of the six BBq joints I visited on a five state tour. I plan on making it back to Old Hickory Pit BBq.